It's inevitable. If you exercise on a consistent basis, life will almost always interfere in one way or another and, often, the interference comes in the form of an injury or a sudden illness. It happens to the best of us and can be frustrating as we get further and further away from our good habits. We start to worry that we'll never get better, never get back to exercise. We worry that we'll gain weight, lose all the gains we've made. If you have the right attitude, you can face your injuries and illnesses without fear. There are any number of common injuries that happen to exercisers. Sometimes it's simply a strained muscle, something that will heal rather quickly. Other times it's more serious--a sprain, a broken bone or a torn ligament. Once you get your injury checked out by a doctor, you have to start the process of healing. Often, the hardest part of that process is allowing your body the time it needs to mend. Be patient. If you've pulled or strained something, your body needs time and energy to heal that injury. Never work through the pain. Follow your doctor's orders. Ask him or her what exercises you can do and ask about a referral to a physical therapist if that's appropriate for your injury. Find alternatives. If you've injured your lower body, stick with upper body exercises. If you workout at a gym, see if they have an upper body ergometer. Swim in the pool, if you have one available to keep up your endurance. Change your focus. If you can't do your normal routine, now is a great time to try something you would usually avoid under normal circumstances. Bellydancing anyone? Stay busy. If you can't do any activity at all, the last thing you want is time to sit around and be miserable. Think of your recovery time as a time to catch up on life--reading books, spending time with the family, writing the great american novel, etc. Remind yourself that this is a temporary thing. This is only a short blip in your life that will be over before you know it. If you're worried about gaining weight, adjust your diet. If you're not getting as much activity as before, keep track of your calories and cut some wherever you can to minimize the damage. You might gain a few pounds but just remind yourself that, in the end, this forced rest is making you healthier in the long run. Listen to your body. If you have a cold, try a light workout. If you start to feel crappy, that's a great time to stop and rest. Try relaxing activities. If you're sick, the last thing you want is a killer workout. Now is a good time to soothe yourself with some stretching or yoga exercises. Stay away from the gym if you're contagious. No one else wants what you have. If you do workout, make sure you're hydrated. Avoid working out in extreme temperatures if you can so you don't get worse and FEEL worse. Allow time for recovery. Sometimes cold symptoms can linger for a while, especially that nagging cough. Take it easy with the cardio workouts so you don't make it worse and give yourself time to get better. Remind yourself that your body is fighting an illness. It needs all the energy it can muster for that, so don't take too much away just to get in a workout. In the long run, it's your health that's important...not missing a few workouts. It isn't easy staying patient and optimistic when you're forced out of your routine through no fault of your own. Keep your spirits up! Find some support and be creative about finding ways to stay active. Most of all, put your health first. When you start to feel better, don't jump into your old routine--ease into things and let your body get used to exercise again. Trust your body to tell you what it needs and you'll be back to your routine in no time. If you suffer an injury such as a sprain, strain, muscle pull, or tear, immediate first aid can prevent complications and help you heal faster. One of the most important acronyms to remember if you get a sports injury is R.I.C.E. R.I.C.E. stands for Rest, Ice, Compression and Elevation. Using these 4 immediate first aid measures can relieve pain, limit swelling and protect the injured tissues, all of which help speed healing. When an injury occurs the damaged area may bruise, swell or bleed (externally or internally) and become inflamed. Healing occurs as the damaged tissue is replaced by collagen, perhaps better known as scar tissue. In most cases the tissue needs complete repair before you should return to sports. Rest: If you are injured, stop playing, get medical attention if necessary and rest. 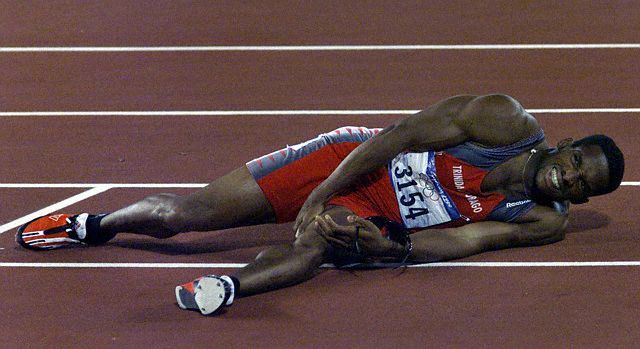 Resting an injury is important immediately after injury for two reasons. First, rest is vital to protect the injured muscle, tendon, ligament or other tissue from further injury. Second, your body needs to rest so it has the energy it needs to heal most effectively. Ice: Use ice bags, cold packs or even a bag of frozen peas wrapped in a thin towel to provide cold to the injured area. An ice massage is another extremely effective way to direct cold to the injured tissue. Cold provides short-term pain relief. It also limits swelling by reducing blood flow to the injured area. Keep in mind, though, that you should never leave ice on an injury for more than 15-20 minutes at a time. Longer exposure can damage your skin. The best rule is to apply cold compresses for 15 minutes and then leave them off for at least 20 minutes. (Read The Proper Use of ICE). Compression: Compression helps limit and reduce swelling, which slows down healing. Some people also experience pain relief from compression. An easy way to compress the area of the injury is to wrap an ACE bandage around the swollen part. If you feel throbbing, or if the wrap just feels too tight, remove the bandage and re-wrap the area so the bandage is a little looser. Elevation: Elevating an injury reduces swelling. It's most effective when the injured area is raised above the level of the heart. For example, if you injure an ankle, try lying on your bed with your foot propped on one or two pillows. After a day or two of R.I.C.E., many sprains, strains or other injuries will begin to heal. But if your pain or swelling does not decrease after 48 hours, make an appointment to see your primary care physician or go to the emergency room, depending upon the severity of your symptoms. Once the healing process has begun, very light massage may improve the function of forming scar tissue, cut healing time and reduce the possibility of injury recurrence. Gentle stretching can be begun once all swelling has subsided. Try to work the entire range of motion of the injured joint or muscle, but be extremely careful not to force a stretch, or you risk re-injury to the area. Keep in mind that a stretch should never cause pain. For proper stretching technique, review Flexibility Exercises. Heat may be helpful once the injury moves out of the acute phase and swelling and bleeding has stopped. Moist heat will increase blood supply to the damaged area and promote healing. Finally, after the injury has healed, strengthening exercises can be begun. Start with easy weights and use good form. See Strengthening Exercises. Beating Achilles Tendonitis -Bruce R. Wilk, P.T., O.C.S. Iliotibial band syndrome (ITBS) occurs when there is irritation to this band of fibrous tissue. The irritation usually occurs over the outside of the knee joint, at the lateral epicondyle--the end of the femur (thigh) bone. The iliotibial band crosses bone and muscle at this point; between these structures is a bursa which should facilitate a smooth gliding motion. However, when inflamed, the iliotibial band does not glide easily, and pain associated with movement is the result. Why did I get iliotibial band syndrome? People who suddenly increase their level of activity, such as runners who increase their mileage, often develop iliotibial band syndrome. 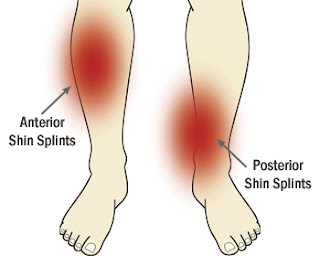 Others who are prone to ITBS include individuals with mechanical problems of their gait such as people who overpronate, have leg length discrepancies, or are bow-legged. What is the treatment for iliotibial band syndrome? Treatment of ITBS begins with proper footwear, icing the area of pain, and a stretching routine. Limiting excessive training, resting for a period of time, and incorporating low-impact cross-training activities may also help. Anti-inflammatory medications may be prescribed by your doctor to help decrease the inflammatory response around the area of irritation. If these treatments do not solve the problem, working with a physical therapist to develop a more focused stretching and strengthening routine may help. Cortisone injection into the area of inflammation may also be attempted, usually after these other treatments fail. If all else fails, surgery is an option, but only in very rare circumstances. If the walker or runner are more experienced then it is from changes of terrain (hills and crowed roads, hard surfaces), increased mileage, Shoes that do not match foot type for maximum support and fit. Muscle imbalances between the anterior and medial (posterior) either due to strength differences or flexibility. Get an analysis of your gait cycle (running or walking form) from a biomechanical professional.